Warrior King is one of several books in English by Sahle Sellassie, all now apparently out of print. It wasn’t easy to find much information about them so I just went for the one which was available cheapest second-hand. It is a historical novel, telling the story of the rise of Kassa Hailu, who starts as an outlaw but eventually conquers the whole of Ethiopia and establishes himself as Emperor Tewodros II of Ethiopia. The obvious comparison for me is with the brilliant Chaka by Thomas Mofolo, also a historical novel about the rise of an African emperor. Mofolo captured something of the brutality and darkness inherent in a man’s rise to power through conquest, and the novel has a real literary heft to it. Warrior King is a much less interesting book. It’s not a complete whitewashing of history — Kassa Hailu is presented as a ruthless figure, even if he is rebelling against an even more brutal regime. If anything, though, it just doesn’t see that interested in engaging with the morality of it, or the psychology. It reminds me of the kind of history books parodied by 1066 And All That: history as a sequence of memorable anecdotes strung together into a basic narrative. It’s certainly not very interesting as literature, but it’s not really very interesting as history either; their just isn’t enough context or detail to make it come to life. There’s surely enough material in the rise of Tewodros II to make either a really interesting history book or a rattling good yarn. This is neither. Warrior King is my book from Ethiopia for the Read The World challenge. 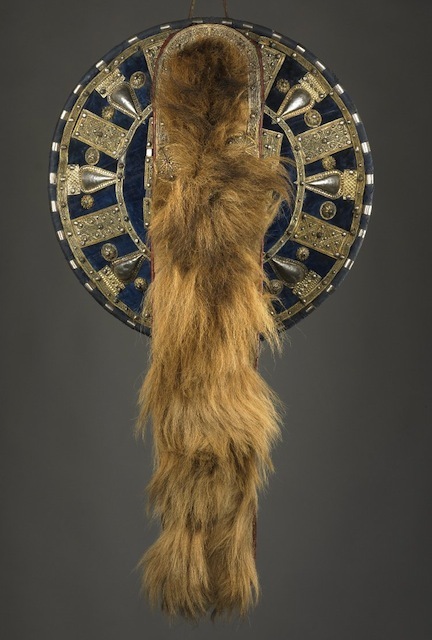 » The shield decorated with filigree and a lion’s mane is the royal shield of Tewodros II which, like quite a lot of his stuff, ended up in the British Museum.